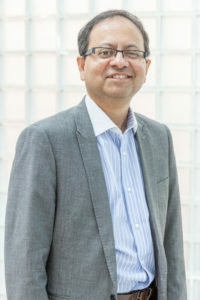 D4D’s Deputy Director and Renal Theme Lead, Sandip Mitra, has been appointed Professor of Renal Medicine at Manchester University Hospitals Foundation Trust. Professor Mitra has led D4D’s renal theme since 2013, and we’re delighted to see his appointment as Professor of Renal Medicine, which reflects his longstanding position at the leading edge of renal medicine. As well as leading D4D’s portfolio of Renal technology development projects and role in advising industry in developing technologies, Sandip is a consultant nephrologist, and speciality lead for the NIHR Clinical Research Network Renal Speciality. He leads the largest home dialysis programme in the UK. He also leads the national Haemodialysis and Vascular Access Clinical Study Group, set up in 2008, and open to all UK renal centres.